PHILLIPSBURG, WILLEMSTAD - The conditional release of casino boss Francesco Corallo (56) still has to be decided by the Common Court of Justice. The judges also said on Tuesday that they will rule on Italy’s extradition request before June 20. The Atlantis Group owner appeared for the continuation of his hearing at the Court of First Instance on Tuesday at 1:50 pm. His case was set for 2:30 pm. Demonstrators stood outside the Courthouse and pandemonium occurred when Corallo arrived. The businessman smiled and raised his hands in solidarity with supporters while being escorted into the Courthouse. The media were told that they could not attend Tuesday’s session. This came as a surprise, as the media were allowed to attend the hearing last month. Lawyers requested electronic monitoring of Corallo while he awaits the Court’s decision on the extradition request. The Prosecution had no issue with the proposal, but the Court had to check with the Prosecution on whether it is feasible. If granted, Corallo would wear an electronic ankle bracelet until the Court makes its decision. The Anti-Corruption Taskforce TBO of the Kingdom Detectives Cooperation Team RST arrested Corallo at the request of Italian authorities on the basis of an Interpol “Red Notice” on December 13, 2016. The Minister of Justice of the Republic of Italy requested Corallo’s extradition on December 30, 2016. In the extradition proceedings, the Court must assess the admissibility of the extradition. If the Court deems the extradition permissible, the involved person can file an appeal in “cassation” with the High Court in The Hague, which takes about a year. 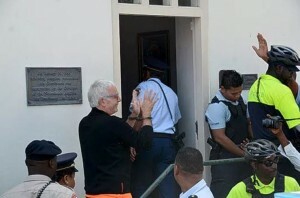 If the High Court allows the extradition, the Governor of St. Maarten has to make the final decision on the extradition. The Prosecutor’s Office has stated on numerous occasions that Corallo will be prosecuted in Italy for, amongst other things, tax evasion of more than 250 million euros, and membership in a criminal organisation. Italy-born Corallo, who has been a Dutch national since July 2000, is also suspected in Italy of using his businesses for money-laundering. The casino boss employs some 300 persons in St. Maarten. Corallo was transferred back to prison at 5:10 pm and workers were informed about the Court proceedings by his lawyers. The Court can decide to suspend his pre-trial detention and allow the electronic monitoring or deny the request any time before June 20.